Due to the hot dry climate of the Southwest, it's an interesting—and often challenging—place for gardeners. In Arizona, for example, many locals have summer lawns and winter lawns to keep their grass green year-round; they do this by growing Bermuda grass in the summer and Ryegrass in the winter. 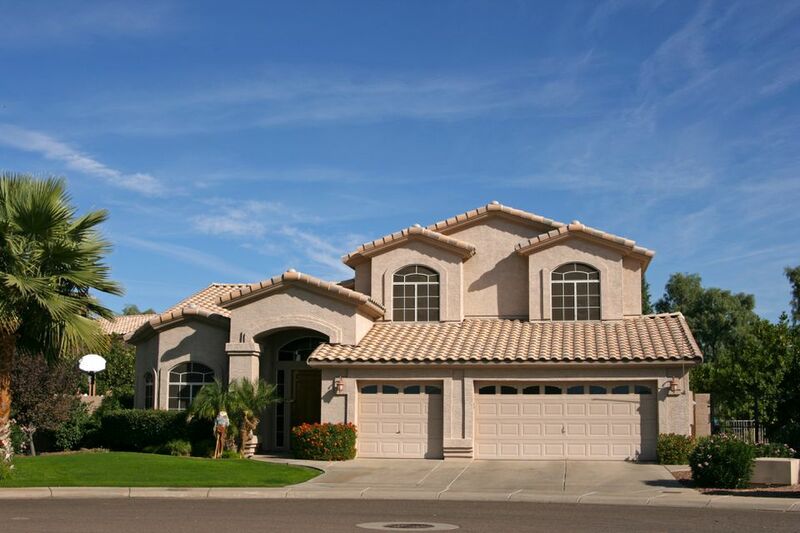 So before you move to the Valley of the Sun, you may first want to consider the upkeep of landscaping your new home. The desert climate in Phoenix means that the winter and summer are very different. In the summer, Bermuda grass is used since it tolerates the city's triple-digit temperatures. But, Bermuda grass is dormant during the winter months. For this reason, if you want your lawn to be green all year, you have to plant winter rye grass. Because Rye does not survive the summer, it needs to be replanted every fall, usually in October. A general rule is that when the temperatures at night are consistently around the 60 F range, you are ready to plant. Ryegrass stays dark green until the middle of May when it quickly dies off as temperatures approach 100 F.
First, you must scalp and de-thatch the summer grass. That means that you must cut the grass back and thin it to allow room for your new grass by making sure the seed gets down to the soil. (You'll need a lawnmower and even a power rake to do this.) The better quality your grass seed, the nicer your lawn will look. Opt for a grass type that is suited for Arizona's desert climate, such as perennial ryegrass instead of annual. Perennial germinates faster, has a finer leaf texture, a darker green color, and is more vigorous than annual. The planting of the ryegrass in the winter is called over-seeding because you are planting rye seed over existing Bermuda. Ryegrass will start to die in early May when temperatures get to around 100 F. Stop watering the grass for a couple of weeks to let it die out, and then begin watering again to awaken your dormant Bermuda summer grass. If you had already planted Bermuda grass in a previous summer, you don't have to replant it again at all. It didn't die last winter—it just became dormant waiting for warmer temperatures. Around May it will start to grow again. In late April or May it starts to get hot outside, so make sure your lawn is getting enough water to grow. Try to limit activity on the dormant grass to minimize the development of bare spots. If you are planting summer grass for the first time, you can do so from seed, but the easiest way to have a great looking lawn is to lay sod. There are basically two reasons that people will have only summer grass. First, planting winter rye grass takes some effort and lots of yard work. Second, having a lawn uses quite a bit of water. Some people conserve water by not planting an additional lawn in the winter. If they don't, the lawn will look dead/yellowish until the perennial Bermuda grass returns. For those that have a homeowners' association (HOA), check first to make sure you may plant a lawn at all, and if you can, whether or not they have to approve the plans. Tip: If you are a golfer, you now know what it means when golf courses tell you that they are over-seeding. You can expect a pretty choppy golf course, where the grass is thin. Toward the end of the over-seeding schedule, you may find that the grass is long and the rough is longer because the golf courses don't want to trim the grass too early.